It’s raining fake pre-poll surveys in Karnataka. This time a fake news clipping claims to show that a survey by the RSS predicts a humiliating loss for the BJP in Karnataka. It’s raining fake pre-poll surveys in Karnataka ahead of voting on May 12. This time a fake newspaper clipping of a popular Bangalore-based daily ‘Kannada Prabha’ purports to show the results of a pre-poll survey conducted by the Rashtriya Swayamsevak Sangh (RSS). The fake newspaper clipping claims that the pre-poll survey done by the RSS predicts a “humiliating loss” for the Bharatiya Janata Party (BJP) in the upcoming assembly election. 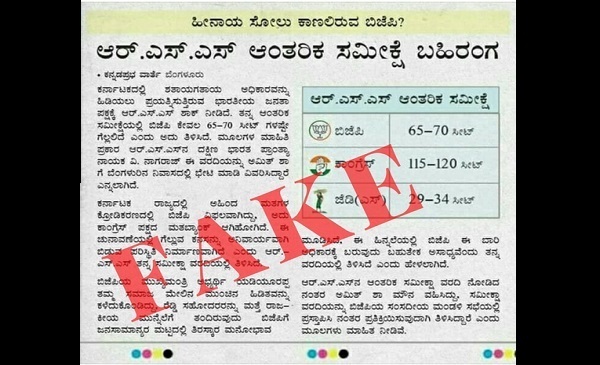 The clipping, which started doing the rounds on May 2 on various social media platforms, has been called out as fake by both – the newspaper Kannada Prabha and by the RSS. The headline of the clipping, which is made to look like an e-paper snippet of the newspaper, reads as ‘RSS Pre-Poll Survey Revealed’’ and has a dateline that reads as – ‘KannadaPrabha News Bangalore’. The fake article goes on to state that ‘the BJP has been trying hard to wrestle back into Karnataka but the RSS has now given it a shock.” It then details that according to the survey, BJP is set to gain only 65-70 seats compared to the Congress which will win with 115-120 seats. It also says that V Nagaraj, zonal head of the RSS for Karnataka, Telangana and Andhra Pradesh met BJP President Amit Shah in Bangalore and showed him results of the said survey. According to the fake article, the survey found that the BJP had failed to consolidate seats in Dalit strongholds. The BJP will have to forego its dream of winning this election, the fake article said. BJP’s chief ministerial candidate BS Yeddyurappa losing his grasp over the Lingayat community along with the Reddy brothers entering the fray were also cited as reasons for voters rejecting the party, the fake article said citing the survey. After seeing the results of the said survey, Amit Shah went silent, according to the article. 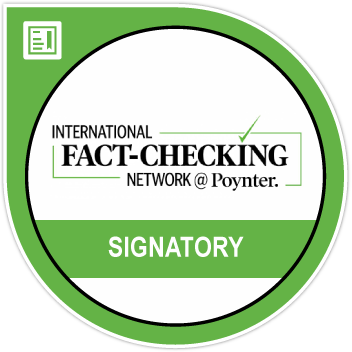 To verify the document, BOOM contacted Kannada Prabha, Editor-in-Chief, Ravi Hegde who said that the news clipping was fake and had not appeared in any editions of the newspaper. “After receiving the said clipping from our sources we checked all our editions and found that it had never been published by us,” Hegde said. “In addition, we also scrutinised the font and the layout and this too did not match with the style sheet used by our designers,” He added that the paper had filed a complaint at a local police station against unknown persons regarding the said article. 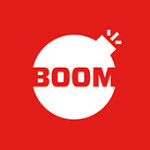 BOOM also contacted Rajesh Padmar, RSS spokesperson, Karnataka who also said the survey and the said clipping was fake. “RSS is not connected to electoral politics in any form. RSS will not conduct any political survey related to the win or loss of a political party,” Padmar said.